"The after sales service of both yourself and Mike was outstanding in every respect. Thank you all for such wonderful service and in delivering a top class model at a realistic price"
One of the five standard model gauges recommended by a subcommittee of the Society of Model Engineers on 1st February 1899 5" gauge is now the favoured choice of enthusiasts who want to experience the exhilaration of driving their own live steam locomotive. There is something quintessentially British about the innate enthusiasm we seem to have to study, build and drive our own miniature steam models. It seems no sooner was the steam engine invented than model engineers were replicating it in miniature. Perhaps early models were used by sales representatives to promote the sale of the full size product, but the hobby side soon blossomed. The development of the model live steam locomotive owes a lot to the efforts of "Curly" Lawrence, known as LBSC. Although not a formally trained engineer he pioneered designs for powerful, and efficient models, that have stood the test of time. During his lifetime he was responsible for the design of 166 model locomotives, many of these still being built and enjoyed to this day. Now there are literally hundreds of model engineering societies throughout the UK with thousands of active members. 5" gauge is the most popular due to the advantages it gives in terms of power, manageable weight and affordability. Certainly some things have changed since LBSC's day that have made the manufacture of the live steam model easier. Modern CNC machining centres and bar-fed lathes make the precision manufacture of multiple components less expensive. Perhaps the biggest step forward is in the production of drawings through the use of 3D computer software. A big step forward compared to the traditional set square and drawing board previously employed. Changes can be quickly made and errors corrected with a few key strokes. Animations are possible to show the function and correct fit of components. CNC machining centres can be programmed directly without operator reference to a paper drawing. In other ways little has changed in the method of manufacture and assembly in half a century. This is especially so in the construction of the boiler. These copper pressure vessels are still formed and silver soldered by hand. The finishing, fitting and assembly, of the hundreds of individual components that make a locomotive done the same way now as it would have been 50 years ago. Painting uses modern stove enamel techniques where both primer and top coat are oven baked to produce a fine, hard, wearing finish. Key to product quality is the amount of time and effort put into development in the first place. Our development lead time is 18 - 24 months from commissioning a model to receiving the first pre-production pilot. We start by providing works drawings and hundreds of photographs of the full size locomotive along with a technical brief from Mike Pavie detailing the specification required. Our designers then create 3D computer drawings and 2D dimensioned drawings for Mike Pavie to check. This iterative process continues for about 5 months at which point we are able to sign off on the design and authorise the manufacture of the first pre-production pilot model. This is delivered around month 10 and the model is subject to a visual and technical inspection followed by steam trials. Following trials Mike provides a list of improvements he requires and is provided with revised drawings demonstrating the changes have been fully actioned. We then authorise the build of the second pre-production pilot model which should achieve "production standard". Before accepting delivery of the production batch we randomly select from finished stock a production model to be delivered in advance for checking. This is a long process, but worthwhile because it ensures customers can order with confidence. We are happy to support customers with a full 12 months warranty. 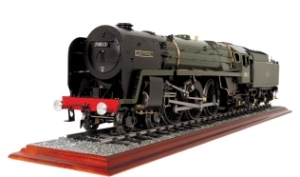 By the end of 2018 we will have manufactured and delivered over two hundred and fifty 5" gauge live steam models. There are a number of models currently in development and others planned. We look forward to serving existing and new customers for many years to come.